On July 3, 1963 I held up my hand in the military induction center in Memphis, Tennessee and took the oath of enlistment and was sworn into the United States Air Force. At the time, I was still four months short of my eighteenth birthday. It was the beginning of twelve years of a life that very few, even those in the Air Force, never experience. After basic training and aircraft mechanic's training, I as assigned to a Tactical Air Command troop carrier wing at Pope Air Force Base, North Carolina. 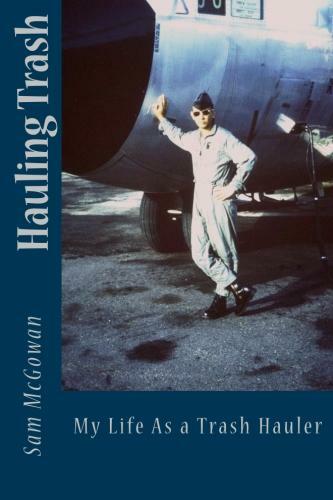 The following August I was one of fifteen young aircraft mechanics who were selected to cross-train into the aircraft loadmaster field and take our places as members of troop carrier crews on the C-130 aircraft. It was the beginning of a brand new life. Over the next eleven years, I saw much of the world as a crewmember on C-130s, C-141s and C-5A transports. I must say that my time on C-130s was the most exciting. Most of my C-130 time was logged in the skies over Southeast Asia, including over North Vietnam and Laos on classified special operations missions. After eighteen months back in the States, I got orders to go back to C-130s in the Pacific and to a new mission as a crewmember qualified to drop huge 10,000-pound M-121 bombs. HAULING TRASH is my story of those twelve years.